board crashed into a freight train at Chatsworth, 50 kilometers (30 miles) northwest of Los Angeles, killing 25. – More recent accidents – More recently the United States has seen a string of deadly train accidents. – One person died and 114 were injured on September 29, 2016, when a morning rush hour commuter train ploughed into a station in Hoboken, New Jersey, a major transport hub for Manhattan. – Ten people died on January 14, 2015, when a bus carrying 15 prison inmates and staff plunged off a Texas highway overpass and onto railway tracks below, where it was hit by a train. 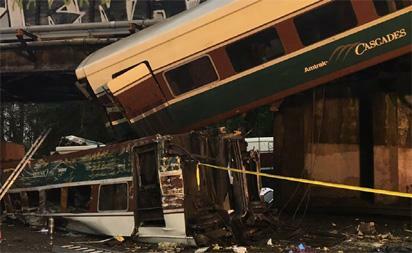 – Eight died on May 12, 2015 when an Amtrak train linking Washington and New York with 243 people on board derailed in Philadelphia, killing eight and injuring more than 200. The accident took place when the train entered a curve as it travelled at 170 kilometers (106 miles) an hour, twice the permitted speed. – Six died on February 3, 2015 outside New York City when a packed commuter train and a car which was crossing the track collided, leaving six dead and 15 injured. – Four died on December 1, 2013, when a suburban train travelling too fast missed a bend as it arrived in the Bronx in New York, killing four and injuring 67.